greatly benefits from its 360° rotation. To achieve this, our ROTOTOP® rotary drive can be directly mounted on to it. It is essentially more economical to purchase the rigid VARIOLÖFFEL® and then operate it with a rotary quick-coupler. For direct mounting on to the excavator, our robust rotary drive ROTOTOP®with all its variants is a suitable choice. 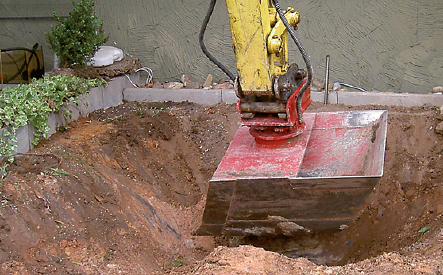 Using the latter, ALL attachment tools can be rotated at 360°. The VARIOLÖFFEL® is entirely made of Hardox and therefore extremely robust and wear-resistant. Due to its v-shaped design, the VARIOLÖFFEL® is a true light weight when compared to other flexible excavator buckets..
Our VARIOLÖFFEL® helps you save manual labour. It is used in all trades whenever the conventional bucket has reached its limits. In combination with our KRANFIX®, the VARIOLÖFFEL® can also be used with forestry cranes. Our patent-protected VARIOLÖFFEL® is undoubtedly the most flexible excavator bucket on the market. The VARIOLÖFFEL® makes the use of excavators ranging from 2.0 to 25 tonnes and other machines such as multi-purpose or forestry equipment more versatile and thus more economical. 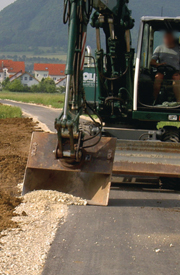 Used in excavation and sewer construction, gardening and landscaping or roadmaking, the VARIOLÖFFEL® enables you to work quickly and with flexibility in all sorts of situations. This is due to its two different work openings (v-shaped and rectangular), its special v-shape and the rounded bottom, as well as its 360° rotation. It may therefore replace some attachment tools in foresting, landscaping, and road-building which may, in this way, also cut costs for their transport. Even in the tightest of construction sites it is possible to work in all directions with great flexibility and to reach every corner without moving the machine. 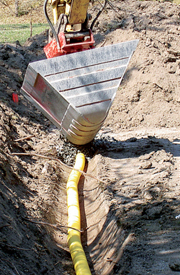 When compared to the trench cutting machine and the rotatable ditch cleaning bucket, the VARIOLÖFFEL® causes no small creatures to be squashed and the trench bottom has a smaller radius. 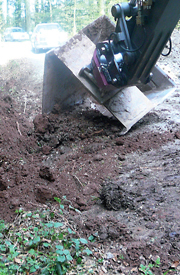 Our VARIOLÖFFEL® thus helps preserve flora and fauna and its shape limits the excavation volume. Furthermore, the round bottom causes an optimal profile to be cut when towed and, by compacting, increases the durability of the banks. As our VARIOLÖFFEL® features two work openings, this opens up the possibility to get a diagonal view from one work opening to the other. Thus enabling operations alongside obstacles, such as kerbs, walls and pipes, without damaging them. The v-shaped opening allows for high-precision filling. Its sides and the rounded bottom make for perfect levelling and compacting of areas in no time. 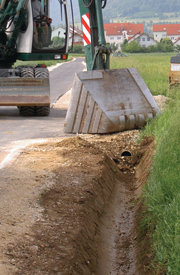 Moving trees, positioning rocks, cutting ditches, laying pipes - there is simply no mode of operation which is not mastered with great skill by our VARIOLÖFFEL® Owing to its versatility, it is possible to replace several attachment tools by it and also save the time required for changes. Our VARIOLÖFFEL® may be used for a number of applications, not only for ditch cleaning when towed, stripping of shoulders and banks. Also available in special sizes! 700 litres VL 2,000 - 10,000 r.m. 400 litres VL 1,500 - 7,000 r.m. 200 litres VL 750 - 4,000 r.m. 100 litres VL 300 - 2,000 r.m.